I’m a huge fan of Parisian interior designer JEAN-LOUIS DENIOT and if I ever own a Parisian pied-à-terre, you can bet that I will be calling Monsieur Deniot to decorate. 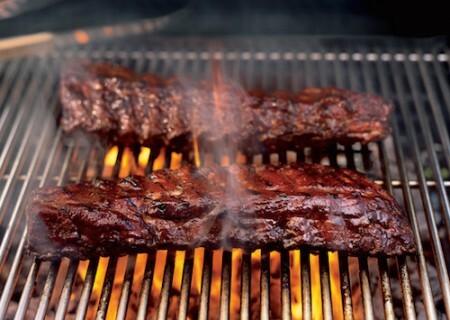 Don’t roll your eyes…a girl’s gotta dream big! So, for a bit of design candy, may I present Jean-Louis’ take on Parisian chic for a growing family. In the living room, the artisans at Atelier Lison de Caunes in Paris worked with Jean-Louis to design a coffee table inlaid with Burgundy rye straw using a centuries old marquetry technique. 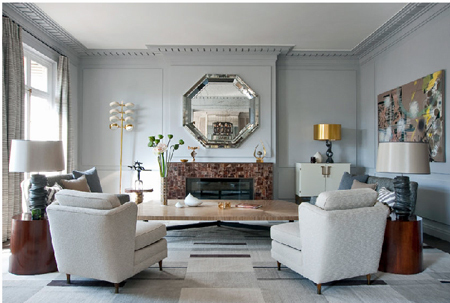 The ivory chest next to the mica fireplace was designed by Guy Lefévre for Maison Jansen. The lamps are by Mathilde Pénicaud. I’m obsessed with this hallway lighting—the Gio Ponti wall sconces pared and the Danish brushed copper and wood ceiling lights by Holm Sorenson & Company. 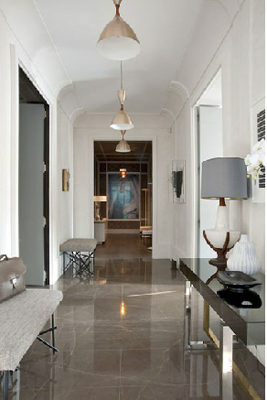 In the entry hall, you get a sense of the apartment’s scale and depth. 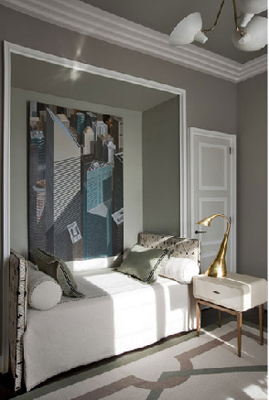 Jean-Louis tore down walls and realigned doors to create an enfilade to add dimension to the apartment originally designed in the Baron Haussmann-style. 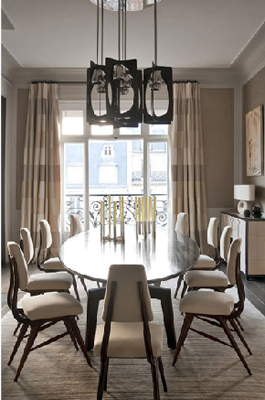 In the dining room, Jean-Louis designed the mahogany table and parchment and wood sideboard. The dining chairs are Carlo Graffi and the artwork is by Philip Guston. 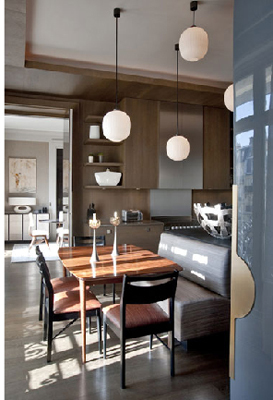 In the dining room, notice the apartment’s high ceilings and the sculptural ceiling fixture versus the scale of the dining table and chairs. The kitchen has several vintage pieces like the white hanging lights, a 1950s walnut table and the Paul Frankl chairs. 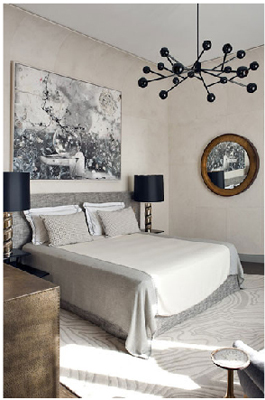 The master bedroom has a rosewood mirror and a Damien Langlois-Meurinne ceiling light. The headboard is covered in a Westbury Textile and the artwork is by Carter. 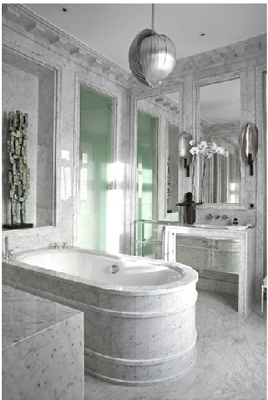 Jean-Louis used mostly Carrera marble and mirror in the master bath. The ceiling light is Vernon Panton and the wall sconces are Herve van der Straeten. 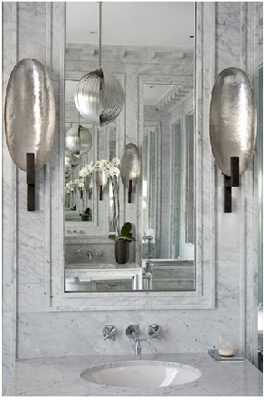 A closer look at the sconces by Herve van der Straeten. In the children’s room, there is a Julian Chichester bedside table and a Philippe Hiquily Swan lamp. 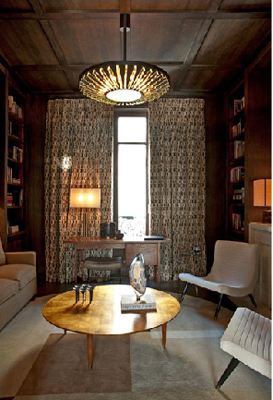 Jean-Louis’ inspiration for the library was a cigar box, so he covered the walls in palmwood and leather. The coffee table is walnut with gold leaf and is topped with agate by Willy Daro. Love his work and love Parisian design!